The Preschool Department of Philippine International School Qatar (PISQ) celebrated its 16th year through a 3-day celebration of the Preschool Week with the theme ―All About Me: My Journey in Making My Dreams Happen‖ from Oct. 30 to Nov 1. The activities during the first day included the launching of Preschool Week followed by the Literary Contest in Villagio Hall. The Nursery Level had their Nursery Rhyme competition where they showcased different versions of ―Skidamarink‖. Meanwhile the Kindergarten pupils had their Choral Recitation entitled ―I am Fast and Fun‖, while the Preparatory pupils presented a mini-play of ―The Goldilocks and The Three Bears‖. Miss Neuwee Martinez, Miss Catherine Rillera and Miss Jolina Macatangay were the judges. On the second day activity was held at Villagio Hall, the Quiz Bee Contest. The contest started from Nursery Level with 13 contestants, followed by Kindergarten level with nine contestants and the Preparatory Level with ten contestants. Categories include English, Mathematics, Cultural Arts, Computer and Filipino for Kindergarten and Preparatory levels. 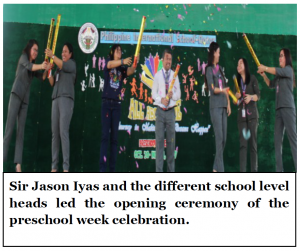 The third day of the celebration was the awarding ceremony held at the covered court. The following winners received Ribbon and Certificate of Recognition.